The Double Exposure variant of blackjack is one of a kind, allowing players to view both of the dealer’s first two cards before playing out their own hand. While traditional blackjack games reveal only one dealer card, in Double Exposure the player is able to make his or her decisions already knowing the two-card dealer total. *If the dealer and player both have blackjack, depending on the rules, the result may be considered a player win or a push (get your money back). More often than not, such a scenario is considered a player win. Also note that you will lose your hand if you and the dealer both have 21, totalled any other way besides a blackjack hand, as this is a tie (for example, a hand made up of a Seven, Eight and Six). Dealt almost exactly like a traditional hole-card (American) game of blackjack, all players receive one face up card (from the dealer’s left to right), the dealer receives a face up card, each player receives his or her second card, and then the dealer receives his or her second card – however this card is also dealt face up. All players now know the dealer’s two-card total. Play out the game following basic blackjack strategy first and foremost. However, your strategy will need to differ from basic strategy when you are placed in a scenario in which you would typically stand, but are now forced to hit due to the dealer’s total. 1. You are playing two hands, simultaneously (something which the Double Exposure games available at our recommended gambling sites offer). For one hand you are dealt a King and a Seven, and your other hand shows an Ace and a Five. The dealer is showing a Jack and an Eight. You would traditionally stand on a total of 17, but in this game you are being forced to hit as the dealer already has a total of 18, and hence if you choose to stand, you would lose. Hope for a Deuce, a Three or a Four. With the Ace/Five hand follow basic strategy, which would suggest to hit. You can access the Wizard of Odds Double Exposure blackjack strategy charts here if you are keen to follow to a tee the exact recommendations, based on probability, of how to play out your hand. 2. If the dealer is showing a two-card total of 20 and you are also showing a two-card total of 20, then all you can do is hit and hope for an Ace, as all other results will see you lose through either a bust or having a tied hand with the dealer. The more flexible the rules are for splitting and doubling down the better. The online variant of Double Exposure is typically played with a six-card deck, but here are no hard and fast rules, and you may come across versions with slightly altered laws in regards to how many decks are used, and when and when you cannot double and split, as alluded to above. Net Entertainment’s Double Exposure – the game we recommend to play, which is available at www.GdayCasino.com – has a 99.33 per cent theoretical return (equivalent to a 0.67 per cent house edge). It allows the player to double down after splitting, pays out 1:1 on tied player and dealer blackjack hands, utilises six decks and forces the dealer to stand on all 17s (and draw to 16). Dealer standing on a soft 17 increases the house edge by 0.39 per cent. Allowing a double down after a split increases the house edge by 0.32 per cent. A tied blackjack which is considered a win (rather than a push) boosts the house edge by 0.22 per cent. Allowing the player to split only once reduces the house edge by 0.71 per cent. If doubling is only allowed when your two-card total is 9-11, the house edge is reduced by 1.04 per cent. 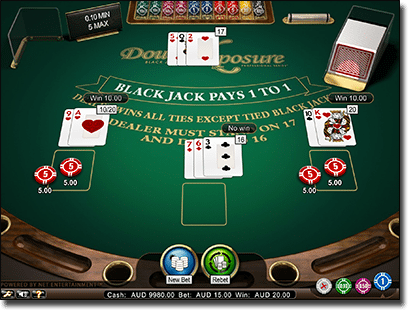 Double Exposure is an entertaining and valuable offshoot of blackjack, and even though we typically recommend to steer clear of blackjack variations which do not pay out 3:2 on genuine blackjack hands, because you are privy to both of the dealer’s cards in this game, the 1:1 payout for blackjack is a concession we are happy to make. The Internet gambling websites recommended above are legally accessible to all Australian residents, AUD currency is accepted, and popular and secure banking methods are provided, such as credit and debit cards, e-wallets, pre-paid cards and vouchers and direct bank/wire transfer systems. As always, set yourself a time and expenditure limit when gambling, and enjoy the online gaming experience. While this variant is unavailable offline within most land based casinos, several of our endorsed, licensed and regulated online casinos do offer the game, including those leading online casino sites listed in our casino table above. These sites each offer a range of great blackjack variants, with safe deposits using multiple payment methods and all transactions protected by digital encryption security. Sign up at any of the above online/mobile gambling sites and enjoy safe and secure real money Double Exposure, other blackjack variants and live dealer casino games.We recommend Bovada Casino as our top-rated casino site for players from United States, which has some excellent welcome bonuses available for new players along with a great range of blackjack variants, online slots and other table games.